The Warsaw Dance Theatre Atelier (Atelier WTT) is a dance theater created by chosen participant of Dziurosz Contemporary Dance Studio. The programme of Aleksandra Dziurosz' Contemporary Dance Studio is intended to educate dancers mostly in the field of contemporary dance, but not only. In the 2010/2011 season, the program has expanded to include two additional dance forms: Classical Ballet and Dance Improvisation / Composition. These classes aim to enrich the dancer/actor's repertoire and skill, developing them into even more versatile artists. 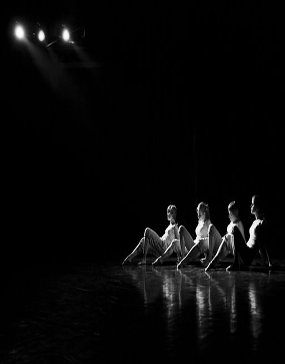 The originator of the Studio intends for the students to develop their skills and eventually become part of the Studio's team – the dance theatre. At present, the team – Atelier WTT – consists of 8 people and is open to new members. The studio can, therefore, welcome new dancers on an ongoing basis. The main source of recruitment for new members to Atelier WTT is the Contemporary Dance Studio. In order to ensure the team’s continual development, both artistically and technically, artists from outside the Studio are invited to participate in spectacles. Apart from classes included in the programme, the Studio’s schedule contains some permanent evening workshops, such as „BODY-ART-MOVEMENT” conducted monthly on the stage of Mazovia Region Centre of Culture and Arts. All participants of the Studio's classes and invited artists take part in these evenings. What is more, workshops conducted by major Polish modern dance teachers are held regularly. The program of Dziurosz Contemporary Dance Studio classes is available here. Atelier WTT dancers: Iwon Dominika, Kabala Eliza, Koss Urszula, Kossowska Dorota, Kowalska Sylwia, Łąpieś Marta, Musielak Michalina, Rams Ewa. Program: „THE STORY OF THE WELLS” (Inoj Dance Theatre), „THE WAY 2” (Atelier WTT), „Am.AM.” (Warsaw Dance Theatre). Program: „CIUCIU-BABKA” (Rękawiczka Theatre) „ARIA?”, „THE WAY” (Atelier WTT), „DAILY STORY”, „OPEN POEM” (Dziurosz Dance Studio), „CONTRASTS” (Warsaw Dance Theatre) and guests: Katarzyna Stefanowicz, Aleksandra Bożek-Muszyńska, Aleksandra Zdunek. Program: „BREVE REGNUM” (Anna Pietrykowska) „BLUE No.16 & 34” (Laura Murphy), „TALK ABOUT FREEDOM” (Kamila Borowska), „NETKA” (Anna Regulska), „WITHOUT TITLE” (Latiga Group), „WATER, WATER, WATERMELON” (Agnieszka Kryst), „TRIFLES” (Exceed Dance Theatre), „I THINK I MADE YOU UP INSIDE MY HEAD" (Liwia Bargieł), „RESEARCH” (Atelier WTT), „UNLEAVENED” (Aleksandra Bożek-Muszyńska, Aleksandra Zdunek), „CELIBATAIRE” (Joanna Drabik), „MARRIAGE” (Warsaw Dance Theatre). Program: „PUPILS” (Inspiration Group Theatre), „RITUAL-BODY-VOICE” (after-workshops performance), „BABY-LON” (Atelier WTT), „TRANS-FORM” (premiere, performance „Trans-form” is a product of artistic project „Sweden 2010”). Program: „BABY-LON” (premiere, Atelier WTT), „THE WAITING STONE” (Laura Murphy, Warsaw Dance Theatre), „ESSENCE OF IT” (Kamila Giergon` contemporary dance group). Program: „GAME”, „ON THE EDGE”, „RUNNING” (students of Dziurosz Contemporary Dance Studio), „I’m all right now, or short story about meaningless searching of sense in luck of meaning" (premiere, Atelier WTT), „IMPRO-TANZ” (students of Fryderyk Chopin University of Music in Warsaw), „RAIN”, „EVOLUTION”, „BLIND”, „NAME”, „BRAIN”, „HEAT” (participants of Inspiration Project). Program: „O_N_E”, „GRIN, GRIN”, „PERTURBATIO” (students of Dziurosz Contemporary Dance Studio), „DAY BY DAY” (Atelier WTT), KOMPANIA TANECZNA of Karolina Kroczak, MUFMI Dance Theatre of Anna Piotrowska, WARSAW DANCE THEATRE, Aleksandra Dziurosz. Program: „NEU-TRIS” (Atelier WTT), „DAY BY DAY” (Atelier WTT), „EYELASHES” (Karolina Kroczak), „DUET...” (Katarzyna Kizior, Szymon Osiński), „THE LAST DAY” (Aleksandra Dziurosz). 26/XI/2009 – performative action „Akcja Teren” („Action Terrain”), Com’in Festival, Fryderyk Chopin University of Music, Warsaw, Poland. 2/II/2008 – performative action within Cultural Weekend „CARNIVAL”, Mazovia Region Centre of Culture and Art, Warsaw, Poland. 21/V/2011 – stage performance „2 be continued”, Theatre Festival InQubator Ulicy vol. 2, Ostrołęka, Poland. 15/V/2011 – performative action during the O Holender! Festival, Netherlands Embassy in Warsaw, Warsaw, Poland. 3,4/XII/2010 – performance of „Baby-lon”, Festival RE:WIZJE IV Inwazja Sztuki Niezależnej (the 4th edition of RE:VISIONS Independent Art Invasion), Palace of Culture and Science, Warsaw, Poland. 29/IX/2009 – performance of „10 tańców polskich na orkiestrę kameralną” („10 Polish dances for chamber orchestra”), International Culture Program Crosspoints, Sochaczew, Poland.